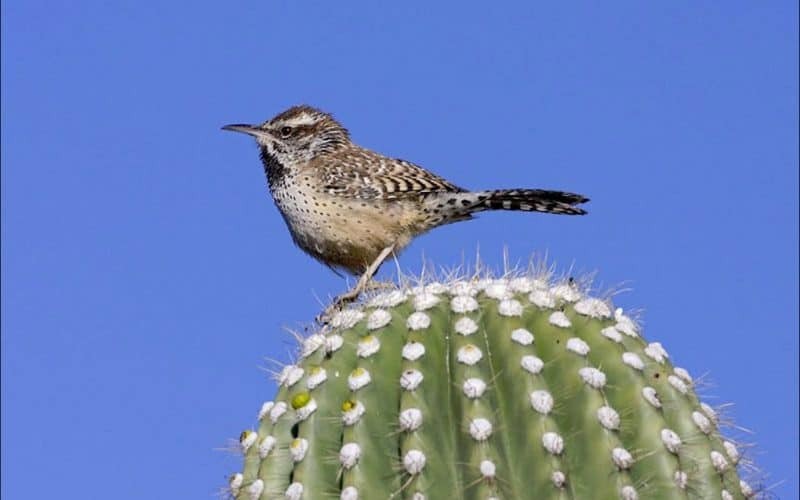 Cactus Wrens are about 8 inches long with a wingspan of about 11 inches. They are brown birds with a reddish brown cap, broad white streak above the eye, brown and white streaked back and a spotted breast. The male and female look alike. They are the largest wren in North America and are the state bird of Arizona. Cactus Wrens nest from mid-March to early September. The nest is roughly the size and shape of a football with an opening at one end. It is made entirely of grasses. The nest is lined with soft materials such as feathers, fur and plant down. Both parents construct the first breeding nest, where the female lays 3 to 5 eggs. The male then builds one or more decoy nests while his mate incubates. These nests are all kept in repair and are used throughout the year for night roosts. Nests are typically placed in thorny bushes such as cholla cactus as a deterrent to predators. Cactus Wrens hop around on the ground and climb through low vegetation in search of insects, seeds and fruit. They will lift stones looking for insects. They commonly perch in cholla and ocotillo. The song is a low chugging unmusical series of krrr, krrr, krrr. It sounds a lot like the starter motor on a car that won’t start. The song is easily recognized. Cactus Wren pairs stay together year round and are thought to mate for life. They are year round residents of Sabino Canyon and multiple individuals are seen on most nature walks in the canyon.